But functionality and beauty shouldn’t be mutually exclusive when it comes to homewares and more often than not it’s the little details – the decorative accessories – that can make a big impact on your property’s overall look while serving a really useful purpose. We asked interior designer Lesley Taylor for her tips. It goes without saying that the home should have at least one mirror – if only to check your appearance before heading out. A well-placed mirror can also create the illusion of space which is ideal in smaller rooms such as an entrance hallway or cloakroom. Hang it in the right place and they also reflect the natural source of light to create a more airy environment. But with the wealth of mirrors now available they can be both decorative and functional. Choose a large statement piece and it will take centre stage in an entire room; or create a bespoke feature wall by hanging a selection of small mirrors close together in a unique pattern. What was once simply a receptacle for flowers has now turned into a decorative accessory in its own right. Vases are available in a multitude of shapes and sizes and are perfect for cementing a colour scheme. And why not try putting them somewhere different? Choose three varying examples and place them directly on the floor to draw attention to a particular spot in the room or pop by a mirror to reflect the vase and its contents. It’s hard to avoid clutter in the home but it is easy to organise it. 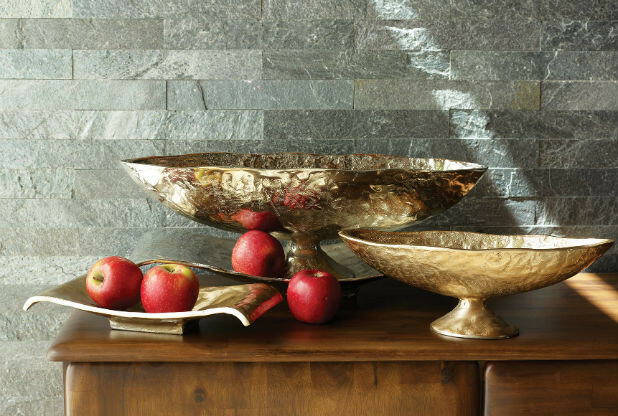 Decorative bowls and boxes are a great addition to up the style stakes in any room but they can also be used to store those everyday items that have a habit of cluttering up surfaces. Choose three different size bowls and use them to stow keys, money and even household bills you haven’t got round to filing. Be bold and leave them bare or if flowers aren’t your thing but you want to truly define a space try filling with different items; shells and sand in the bathroom, coffee beans in the kitchen or fairy lights to create an ambient source of lighting.